With essays by Peter Assmann, Rainer Metzger, Clarissa Stadler and Xiao Xiaolan. “Xenia Hausner. Damage” contains many photographs which provide an insight into the artist’s studio and her work processes. 75 colour reproductions show pictures from the different stages of her creativity and will be on display in a solo exhibition at the Shanghai Art Museum. Xenia Hausner paints people. The focus of her new work is a collection of pictures, dealing with love and loss and the catastrophes of our present age. These large-format pieces are a continuation of a series which in its entirety explores interpersonal confrontations and balancing acts in relationship. 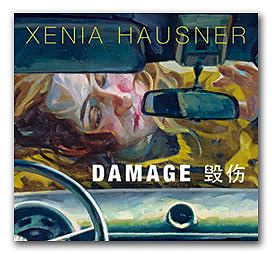 Xenia Hausner merges strikingly in her artistic work the current state of knowledge in the field of painting and photography, supplemented by a precise knowledge of staging within the entire complex of scenery, extras, performance spaces, actors and their stage presences – knowledge that she has acquired thanks to her many years of successful work as a set designer. She also skillfully introduces another important accomplishment of twentieth-century European art history to her pictures: the collage, combining various elements into a new pictorial entity, into a new pictorial conglomerate. She astonishes the viewer with colours that make a statement, dappled contrasts, conscious appeals to a quick effect on the eyes – colours supplemented by their chromatic quality and underlined by the knowledge of pictorial aesthetics in their application; the strongly expressive brushstrokes not only produce an effect of their own but also depict a form and additionally fulfil their functions in harmony with the entire image. Xenia Hausner grasps and extracts the situation in which people reach the extreme of their psychological and physical limits. She condenses and describes it. At the same time she encourages viewers to think about it from the perspective of their own life experience. (…) The interaction between the person posing and the background, and with it the corresponding layout, makes the viewer think he or she is gazing at a theatrical miniature. Since 2003, she has combined painting with photography to reinforce these new elements in her art.